Proposition bets for Super Bowl LI are displayed at the Race & Sports SuperBook at the Westgate Las Vegas Resort & Casino on Jan. 26 in Las Vegas, Nev. — one of four states where sports betting is legal. The law called the Professional and Amateur Sports Protection Act, passed in 1992, prohibited sports betting, except in four states where it had already been legalized — mainly Nevada, and to a lesser extent Delaware, Montana and Oregon. It gave the other states one year to legalize such betting, if they wanted to do so. Separately on Monday, the Supreme Court also handed down decisions in two other important cases, dealing with personal rights. In Byrd v. US, the court ruled unanimously that police who stop a motorist for a traffic infraction may not search a rental car without a search warrant, even if the driver's name is not on the rental agreement. And in McCoy v. LA, the court, by a 6-3 vote, ordered a new trial for a capital defendant whose lawyer conceded his guilt to the jury, disregarding the explicit instructions of his client. The court's sports betting decision, written by Justice Samuel Alito, said the federal law had unconstitutionally commandeered the states' lawmaking authority. The law at issue here, he said, "unequivocally dictates what a state legislature may do and not do," thus putting state legislatures "under the direct control of Congress. Congress, he said, can regulate sports gambling directly, but it can't pass the buck to the states, telling them how to regulate their own citizens. While the Court's decision was couched in constitutional terms, the results were a lot more mercenary. "Gambling is a huge, huge fan engagement tool," said Andrew Brandt, director of sports law at Villanova University. He quoted Nielsen research which estimates that the average NFL fan who is a non-bettor watches about 15-16 games a year. The average NFL fan who is a bettor watches 45-50 games a year. "That kind of information is gold!" Brandt said. Brandt went on to list a number of states that are "on deck" to enact legislation that would legalize sports betting — among them New Jersey, Pennsylvania, Delaware, Connecticut, Iowa, Mississippi, New York, and West Virginia. Another dozen states have publicly announced plans to do so at different speeds. One state that is an "absolute no" for sports betting is Utah, which has an anti-gambling provision written into its state's Constitution. But most experts expect a majority of the states to legalize sports betting in the next year or two, thus providing the states with a new and needed tax revenue stream. With every player in the sports world seeing dollar signs, there is one problem player — the amateur athlete. Amateur athletes are the most vulnerable to corruption because they are not paid, noted Michelle Minton of the Competitive Enterprise Institute. That's why the NCAA could throw "a wrench in the works," said John Wolohan, professor of Sports Law at Syracuse University. Professional players make too much to risk throwing a game, he said, but a kid on full athletic scholarship with no money in the bank is much more susceptible when someone approaches him and says, "Hey, you're playing Colgate tonight. You guys are favored by 20 points. Here's $5,000. Make sure it's under 20." The ban on legalizing sports betting was also known as the Bradley Act, after author of the bill, former basketball great Bill Bradley, who served three terms in the U.S. Senate. In an NPR interview, Bradley said his motivation was simple, and personal. "Betting on sports was betting on human beings, and I thought that was wrong," he explained. Bradley said that in invalidating the 1992 law, the Supreme Court "ignored the impact of their ruling on sport," turning "every baseball player, basketball player, football player into a roulette chip." And he said that with this ruling, there is "nothing to prevent betting on high school or even grade school games." Bradley said there was virtually no congressional opposition to his bill back in 1992, though he added that Donald Trump, with failing investments in Atlantic City casinos at the time, lobbied against it, believing that sports betting was the answer to his financial problems there. After the bill passed, New Jersey did not seek to legalize gambling in its one-year window of opportunity. It was not until 2011 that the state, starved for tax revenue, began trying to get out of the ban. Only when it finally got its case to the Supreme Court did it finally prevail. After oral arguments in December, then-Gov. Chris Christie, R-N.J., said on the Supreme Court steps, "If we're successful here, we can have bets being taken in New Jersey within two weeks of a decision by the court. We're like boy scouts; we're prepared." The American Gaming Association estimates that illegal sports betting has grown to $150-billion-a-year market. Expectations are that legal sports betting could significantly outstrip that number. 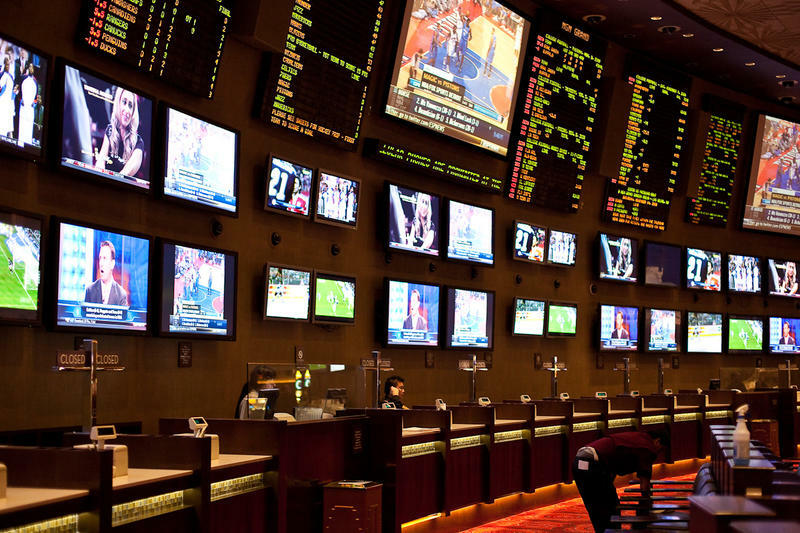 America has seen a cultural shift on the question of sports gambling in recent times. NPR's Uri Berliner reported in 2015 that ESPN has been increasing its coverage of gambling by, for instance, directly referencing the point spread set by oddsmakers. And while the major U.S. pro- and college-sports leagues have "always sought to distance themselves completely from gambling," as Berliner put it, NBA Commission Adam Silver came out in favor of legalizing (and regulating) sports betting in 2014. Then there's the popularity of daily fantasy sports — an industry that has weathered legal challenges of its own. Fantasy sports leagues amount to "thinly veiled gambling," as ESPN's Rob King told Berliner, and have helped push sports betting into the mainstream. It's no wonder that news of Monday's decision sparked a surge in gaming stocks on Wall Street. Jason Robins, CEO of DraftKings, in an interview with NPR, estimated an increase of $15 to 20 billion in revenue in the fantasy sports industry alone if a majority of states end up legalizing sports betting. The ruling Monday opens up a lot more "cool experiences and products we can offer to our customers," he said. By a 6 to 3 vote, the U.S. Supreme Court threw open the door today to sports betting. It ruled unconstitutional a 25-year-old law that had barred most states from legalizing sports betting. The only exceptions were those states where it already existed - principally, Nevada. NPR legal affairs correspondent Nina Totenberg reports. NINA TOTENBERG, BYLINE: The challenge to the federal law was brought by the state of New Jersey, which passed a law to legalize sports betting mainly to gain additional tax revenue and to help struggling casinos in the state. The state lost repeatedly in the lower courts, but today the Supreme Court struck down the federal law as unconstitutional. Writing for the court, Justice Samuel Alito said the federal law had unconstitutionally commandeered the state's lawmaking authority by dictating what a state legislature may do and not do. It is, he said, as if federal offices were installed in the state legislative chambers armed with authority to stop legislators from voting on any offending proposals. Congress, he said, can regulate sports gambling directly, can even ban it, but it cannot pass the buck to the states telling them how to regulate their own citizens. While the court's decision was couched in constitutional terms, the results were a lot more mercenary. ANDREW BRANDT: Here is the bottom line - gambling is a huge, huge fan engagement tool. TOTENBERG: Andrew Brandt is director of sports law at Villanova University. BRANDT: The average NFL fan who's a non-better watches about 15, 16 games a year. The average NFL fan who's a better watches 45 to 50 games a year. That kind of information is gold. It's gold. It is part and parcel of what is driving interest in these sports, and they know it. TOTENBERG: It's no wonder that news of today's decision sparked a surge in gaming stocks on Wall Street. Jason Robbins, CEO of fantasy sports provider DraftKings, said that if as expected the majority of states legalize sports betting, he estimates an increase of $15 billion to $20 billion among fantasy sports providers because they now can openly provide betting opportunities instead of masking their product as a game of skill. JASON ROBBINS: It just opens up a lot more possibilities for different types of cool experiences and products that we can offer to our customers. TOTENBERG: And the sports leagues, which defended the ban on sports betting in the Supreme Court, are already asking the states for a percentage of the expected revenue stream once sports betting is legalized. JOHN WOLOHAN: It's really just a money grab. TOTENBERG: John Wolohan is a professor of sports law at Syracuse University. WOLOHAN: It's amazing where we have billionaire owners basically coming to the states and saying, we want a piece of this. Even though we've said no all along, we want you to give us hundreds of millions of dollars. TOTENBERG: With every player in the sports world seeing dollar signs, there's one problem player - the amateur athlete. WOLOHAN: The NCAA kind of throws a wrench in the works here. TOTENBERG: That's because everybody envisions sports betting as including college teams with a percentage going to the college but not the team players. Michelle Minton is a fellow at the Competitive Enterprise Institute, a free market think tank. MICHELLE MINTON: The amateur athletes are the most vulnerable to corruption because they're not paid. TOTENBERG: The talking point for almost everyone commenting on today's decision is that legalizing sports betting allows it to bloom legally instead of leaving it in the shadows of illegality. 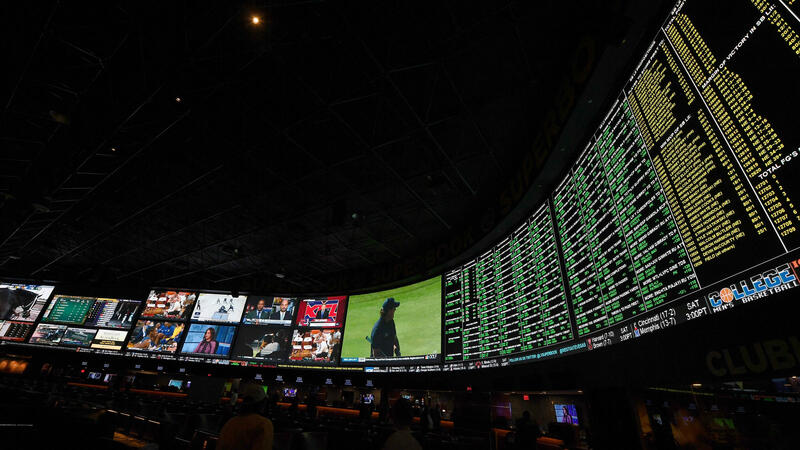 Sportsradar calls itself the central data provider in the legal betting ecosystem overseas and in Nevada, working with the leagues and with law enforcement to spot cheating. Laila Mintas, deputy president of the company, calls today's decision a milestone. LAILA MINTAS: Regulating the markets has been overdue for such a long time. But now the challenge is to regulate the market in a way that makes sense. TOTENBERG: And what we need, she says, is to create a system that allows legitimate sports bookmakers to compete with offshore bookmakers in order to channel that business into the U.S. where it can provide more business revenue and, more important to the states, tax revenue. Nina Totenberg, NPR News, Washington. Transcript provided by NPR, Copyright NPR. 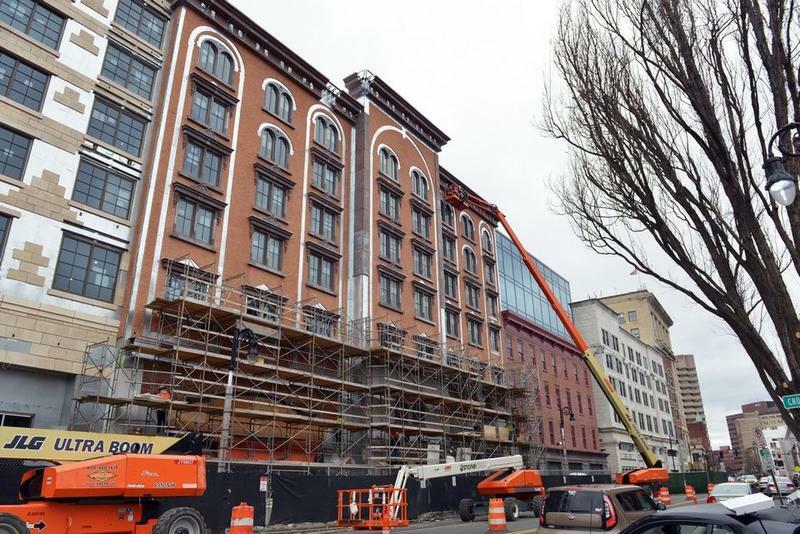 Officials Confident MGM Will Stick Around In Springfield, Mass. MGM announced Thursday it plans to open its Springfield, Massachusetts, casino slightly ahead of schedule, on August 24. The news comes amid speculation the casino giant is wavering on its commitment to the project.